Good afternoon everyone. I'm sorry for not being around this week but I have been job hunting which takes a surprising amount of time! On that vein, you know that you blog too much when you get a text message asking if you're ok because you haven't updated your blog in three days! 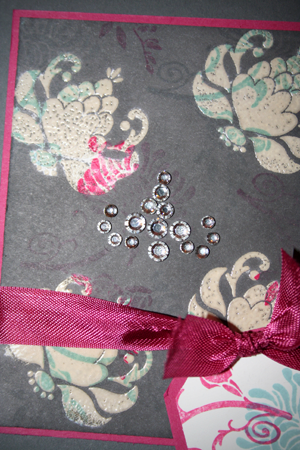 This card began as a left over piece of the patterned paper I have been using for the other cards. I remembered the reverse Joseph's Coat technique that Catherine showed us at my very first quarterly training. 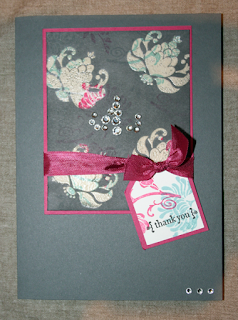 I stamped the blossom image with versamark ink and embossed it with clear embossing powder. I then brayered basic grey ink over the paper so that the pattern showed through underneath the clear embossed stamped image. This kind of resist technique is really effective and thanks to Stampin' Up's coordinating card and ink, it made matting and card making really easy. The embellishment was created using the basic rhinestones ( I need to work on drawing patterns with them!) and added a little something different to this project. The joy of these rhinestones is that they are so versatile, you can do anything with them, including making your own embellishments. I hope you enjoyed this short post, I have to get back to application forms and such so see you tomorrow for a brand new set of cards just in time for father's day! Don't forget that I can teach all of the techniques shown in this blog at a workshop or card class, with the extra incentives for hostesses this month it makes even more sense to book one! I'd love to hear from you so why not drop me a line.